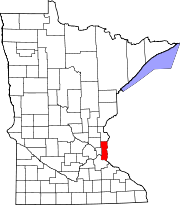 Woodbury is a city in Washington County, Minnesota. It is part of the Twin Cities metropolitan area. Woodbury is situated east of Saint Paul along Interstate 94. The 2016 population for Woodbury was 68,349, making it the 8th most populous city in Minnesota. At almost 36 square miles in size, Woodbury is a direct descendant of one of the congressional townships that Minnesota Territory was divided into when the territory was ceded by the Native Americans of the United States and "opened to settlement." Woodbury was originally named Red Rock, but was renamed Woodbury after Levi Woodbury, the first justice of the Supreme Court of the United States to attend law school, realized that another Red Rock existed in Minnesota. When first settled in 1844, the land was mostly wood but was converted to farmland. The township government was organized in 1858. One of the city's few surviving 19th-century farms, the Charles Spangenberg Farmstead, is listed on the National Register of Historic Places. According to the United States Census Bureau, the city has a total area of 35.56 square miles (92.10 km2), of which, 34.73 square miles (89.95 km2) is land and 0.83 square miles (2.15 km2) is water. The city is bounded on the northern side by Interstate 94, the south by 60th Street, the west by Century Avenue, and the east by Manning Avenue. The adjoining cities in these directions are, respectively, Oakdale, Landfall, Lake Elmo, Cottage Grove, Maplewood, Newport and Afton. Woodbury is composed of upland between the valleys of the Mississippi River and St. Croix River. The northeast corner of Woodbury lies within the watershed of Valley Creek, one of the few remaining trout streams in the Twin Cities area. Valley Creek flows eastwards to the St. Croix River at Afton, Minnesota. The city also contains several small lakes, including Powers, Wilmes, Colby, Carver, and Battle Creek. Battle Creek lake is the source of Battle Creek, which flows westwards to the Mississippi River in Saint Paul. State Farm Insurance was previously[when?] a large-scale employer in the city, but the multi-department facility was relocated to Lincoln, Nebraska while retaining a smaller work force at another site in Mendota Heights. There are also many smaller employers, such as the Joint Commission on Allied Health Personnel in Ophthalmology and offices for financial corporations. Many Woodbury residents are employed at 3M, whose headquarters are located a few miles west in Maplewood. A large portion of the economy is retail. The two largest retail centers are Tamarack Village, near the intersection of Radio Drive and Interstate 94, and Woodbury Village, near the intersection of Valley Creek Road and Interstate 494. Woodbury Lakes, an upscale retail development with an open-air mall layout, was completed in 2005. According to the city's 2015 Community Development Annual Report. Other important employers include eFunds, Long Term Care Group and Dean Foods/Land O'Lakes. Because most of Woodbury is located within the South Washington County School District, the majority of high school students attend either Woodbury High School or East Ridge High School. However, small portions of the city attend Tartan Senior High School in Oakdale and Stillwater Area High School in Stillwater. Some students attend public or private schools in other school districts chosen by their families under Minnesota's open enrollment statute. There are two middle schools in Woodbury, Lake Middle School and Woodbury Middle School. Molly Roeske is the principal at Lake Middle School and their mascot is the "Leopards." Dennis Roos (2008) was the principal, now he is assistant principal at East Ridge High School in Woodbury. Kari Lopez (2009) is the principal and Kelli Isakson is the Assistant Principal at Woodbury Middle School and their mascot is the "Wildcats." Rasmussen College–Lake Elmo / Woodbury campus serves students in the Woodbury area. Rasmussen College is a regionally accredited, career focused college that offeres bachelor and associate degree programs. Rasmussen College concentrates on programs in the following areas: health sciences, nursing, business, technology and design, criminal justice, and early education. Woodbury contains 45 parks covering approximately 3,000 acres (12 km2) and approximately 100 miles (160 km) of trails. The trails, most of which are paved, connect many of the parks. Three of the largest parks encircle Colby, Wilmes, and Powers lakes, respectively. The indoor Central Park is adjacent to the public library. HealthEast Sports Center is the primary athletic location, including softball fields, baseball fields, soccer fields, football fields, sand volleyball courts, two indoor ice arenas, and 1 outdoor ice arena. Two golf courses are located in the city: Prestwick (privately owned) and Eagle Valley (publicly owned). There are many local events year-round. A popular summer event named Woodbury Days is held in Ojibway Park each year. Woodbury Days includes a parade, carnival, live music, fireworks, and many booths for the city's shops, churches, and services. Woodbury Days is also known for its Taste of Woodbury tent located in the parking lot behind Woodbury High School and overlooking the Ojibway Park Band Shell. This tent includes many restaurants in the city. There's also an outdoor pool available by membership in the summer called Colby lake pool. The Minnesota Sting of the NEFL are a semi-pro football team in Woodbury. As of the census of 2010, there were 61,961 people, 22,594 households, and 16,688 families residing in the city. The population density was 1,784.1 inhabitants per square mile (688.8/km2). There were 23,568 housing units at an average density of 678.6 per square mile (262.0/km2). The racial makeup of the city was 81.4% White, 5.6% African American, 0.3% Native American, 9.1% Asian, 1.0% from other races, and 2.5% from two or more races. Hispanic or Latino of any race were 3.8% of the population. There were 22,594 households of which 42.3% had children under the age of 18 living with them, 61.8% were married couples living together, 8.7% had a female householder with no husband present, 3.3% had a male householder with no wife present, and 26.1% were non-families. 20.4% of all households were made up of individuals and 5.7% had someone living alone who was 65 years of age or older. The average household size was 2.73 and the average family size was 3.20. The median age in the city was 35.6 years. 29.6% of residents were under the age of 18; 6.2% were between the ages of 18 and 24; 29.6% were from 25 to 44; 26.3% were from 45 to 64; and 8.3% were 65 years of age or older. The gender makeup of the city was 48.2% male and 51.8% female. As of the census of 2000, there were 46,463 people, 16,676 households, and 12,657 families residing in the city. The population density was 1,327.7 people per square mile (512.6/km²). There were 17,541 housing units at an average density of 501.2 per square mile (193.5/km²). The racial makeup of the city was 90.04% White, 2.51% African American, 0.24% Native American, 5.01% Asian, 0.01% Pacific Islander, 0.62% from other races, and 1.56% from two or more races. Hispanic or Latino of any race were 2.14% of the population. There were 16,676 households out of which 43.8% had children under the age of 18 living with them, 66.8% were married couples living together, 6.9% had a female householder with no husband present, and 24.1% were non-families. 18.8% of all households were made up of individuals and 3.3% had someone living alone who was 65 years of age or older. The average household size was 2.76 and the average family size was 3.20. In the city, the population was spread out with 30.6% under the age of 18, 5.9% from 18 to 24, 36.9% from 25 to 44, 20.5% from 45 to 64, and 6.1% who were 65 years of age or older. The median age was 33 years. For every 100 females, there were 94.1 males. For every 100 females age 18 and over, there were 91.4 males. The median income for a household in the city was $76,109, and the median income for a family was $84,997. Males had a median income of $60,224 versus $37,676 for females. The per capita income for the city was $32,606. About 0.8% of families and 1.7% of the population were below the poverty line, including 1.2% of those under age 18 and 1.2% of those age 65 or over. ^ "Minnesota State Demographic Center 2016 Estimates". ^ Upham, Warren (1920). Minnesota Geographic Names: Their Origin and Historic Significance. Minnesota Historical Society. p. 571. ^ Dabrowski, Mario (1978-05-01). "National Register of Historic Places Inventory -- Nomination Form: Charles Spangenberg Farmstead". National Park Service. Retrieved 2013-12-16. ^ "ISD 833 New High School/BSC - Process Update". Retrieved 9 February 2018. ^ "Elementary Schools - South Washington County Schools". www.sowashco.org. Retrieved 9 February 2018. ^ "Staff Directory - Valley Crossing Elementary School". vces.sowashco.org. Retrieved 9 February 2018. ^ United States Census Bureau. "Census of Population and Housing". Retrieved July 14, 2014. ^ "Population Estimates". United States Census Bureau. Retrieved June 2, 2016. Wikivoyage has a travel guide for Woodbury.